Sebastian Vettel led the Korean GP from lights to flag. 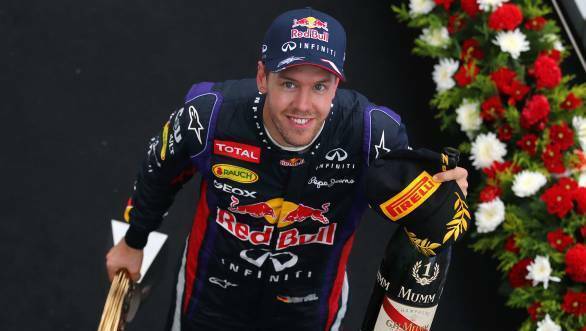 It was as commanding a win as they come, and was Vettel's fourth victory in a row of the past four races. It was also his third win at the Korean GP, making him the most successful driver at Yeongam. But this particular victory of Vettel's is tremendously significant because it has put him in a position to win his fourth title on the trot at next weekend's Japanese Grand Prix. The only man who can rain on Seb's parade will be Ferrari's Fernando Alonso, and there will be scores of scarlet-clad fans at Suzuka hoping for exactly that. Meanwhile, here's how Seb Vettel won the 2013 Korean GP. When the five red lights went out at Korea, Vettel was off into the distance at once, getting a good start and ensuring that Mercedes man Lewis Hamilton simply couldn't catch him. Hamilton, however, was something of a sitting duck to the fast-moving Lotus behind him. There wasn't anything he could do to keep Romain Grosjean behind him, and so he had to relinquish second place to the Frenchman. And while Felipe Massa spun out and forced his team-mate Alonso wide, Vettel was doing what he does best - running away at the head of the order. Kimi Raikkonen proved to be the man on the move in the early part of the race, having started 10th on the grid, but gradually moving up the order, and gaining advantage in the race by pitting earlier than the rest of the pack. And while Hamilton, with a degrading tyre, attempted to defend position from team-mate Nico Rosberg, the latter's Mercedes suffered a lose nose cone that caused the front wing to drag over the tarmac, sparking away. Meanwhile Sergio Perez's McLaren blew a tyre, necessitating the first Safety Car situation of the race. When the race was restarted, Vettel was clear of the rest of the pack, while Raikkonen got the jump on Grosjean, ensuring that he outdid his team-mate. But Adrian Sutil made a mistake in his Sahara Force India, and spun into the back of Mark Webber's Red Bull. Webber's car caught fire, a Fire Intervention Vehicle was deployed on track, seemingly without permission from Race Control, and with the leaders looking likely to catch the FIV, the Safety Car was deployed for a second time. The order up ahead didn't change once the Safety Car went back into the pits. Vettel won the race comfortably from the Lotus duo of Kimi Raikkonen and Romain Grosjean.